One of the biggest advantages that snowshoeing has over other winter sports is its lower cost. The often prohibitive expenses associated with alpine skiing and snowmobiling equipment and clothing can make a hefty dent in a winter vacation budget. The health benefits of sustained walking in beautiful, tranquil settings are free, and with some thoughtful research and planning, snowshoeing can provide an enjoyable, truly affordable winter getaway. On our trips to Colorado and New Mexico the last two years, my wife, Liz, and I found a number of ways to stretch the budget and still have a great vacation. We purchased and studied an excellent book, “Snowshoeing Colorado,” by Claire Walter the summer before our first snowshoeing adventure. Other good area-specific books are available that will not only give you basic information about the sport, but will highlight some excellent trails and nordic centers. Begin by making a list of all the items you might need, from clothing to food. Anything you can purchase before leaving home will probably be less expensive than items bought along the way. Take along a small ice chest for drinks and any perishables you’ll need while on the road. You probably already own all or most of the clothing you will need. Sturdy, comfortable, waterproof boots – which can also be used for hiking in the summer – are a necessity. Snowshoeing is not a fashion show. Comfort and utility are what matters. What you don’t own can often be obtained at discount stores or at sporting goods store sales. Since you’ll be moving steadily most of the time, you will stay warmer than you might think. Layering will keep you comfortable without weight. There are some real bargains at the end of the winter season. Plan ahead and save a lot of your hard earned dollars. Your biggest budget buster will probably be lodging, assuming that you drive instead of fly. Begin early by doing research on the Internet in the areas you are considering. Sometimes, calling directly to a hotel or motel rather than accepting the Internet price can net you an even better deal. Since snowshoeing is the main attraction for us, we seek out less expensive lodging that provides a clean, comfortable room and includes either breakfast, or simple cooking facilities for fixing your own meals. Many of these are surprisingly affordable, as long as you avoid the major corporate resorts. Be sure to ask for any discounts available, such as AARP or AAA if you have them or any others. Carry a discount long distance phone card to avoid exorbitant charges from your hotel or motel room, in case your cell phone can’t get a good (or any) signal. Smaller towns and smaller resorts may offer the best deals. We found that many places in Colorado located along the I-70 corridor are rather pricey, but other locales off the interstate provide equally good snowshoeing for a fraction of the cost. One such place is the Arkansas River Valley between Salida and Leadville. Buena Vista is a charming small town on Highway 24, midway between Salida and Leadville. From there, you can access a number of free trails in the area. Piney Creek Nordic Center at Tennessee Pass is only about an hour away. The Super 8 in Buena Vista is very reasonably priced, has large, comfortable rooms, and an outstanding continental breakfast. A room on the west side will get you a superb view of Mount Princeton as a bonus. Buena Vista is nestled against some of the highest mountains in Colorado, called the Fourteeners. Two good restaurants in Buena Vista are Jan’s, for all around family dining, and Quincy’s, where you can enjoy a filet mignon dinner for under ten dollars. A word of caution: All Super 8 motels are not equal. Buena Vista’s Super 8 is exceptional in every way. A nice Best Western is directly across from the Super 8. The Trailhead Outfitters is half a block away from the motels. You can rent good quality snowshoes there. The proprietors will provide you with maps, local information, and point you to some good trails in the area. Many of these trails are used for hiking in the summer. 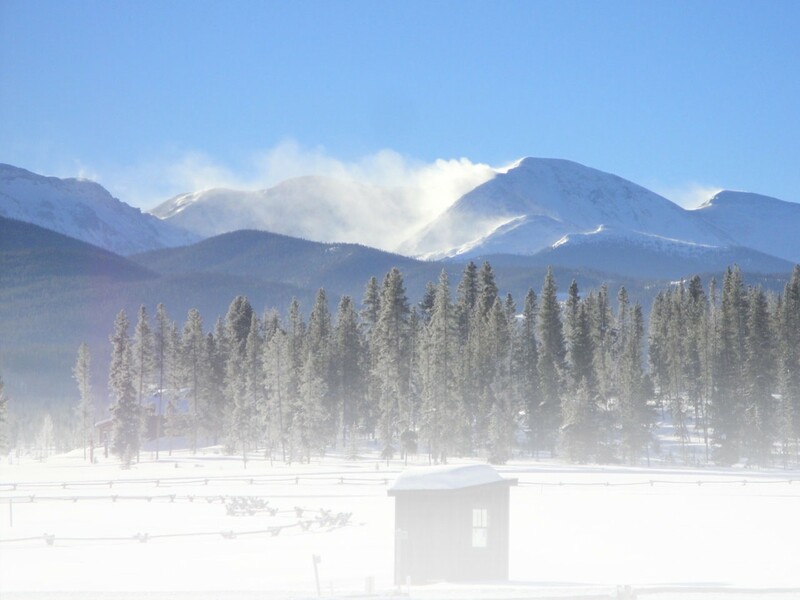 They provide excellent views of Colorado’s Sawatch Range and most are free. When we head out for a day of snowshoeing, we bring along a backpack stocked with plenty of water and an ample supply of fruit, nuts, energy bars and peanut butter sandwiches. We stop along the way to nibble, and enjoy these for lunch before continuing on the trails. A light and healthy lunch keeps us going so we don’t lose energy in the afternoon. Dinner can be more of an occasion if we go out, or we might fix something simple if we have kitchen facilities such we had on our last trip to Red River, N.M. If you snowshoe at a nordic center, always ask about multiple day discounts or senior discounts if they apply. Even at full price, trail passes are rarely over ten to twelve dollars a day. Nordic centers that offer snowshoeing (and most do) also rent snowshoes. Expect to pay anywhere from $8 to $15 a day. For those who live in or near the snow-belt, remember that snowshoeing close to home can really save money. Unlike some winter sports, snowshoeing doesn’t require mountains and flatter terrain usually means flatter prices. The only thing better than a good vacation is a good vacation that hasn’t broken the bank. With some good planning and a willingness to seek out discounts, you will find that snowshoeing is a healthy, fun, and very affordable sport.